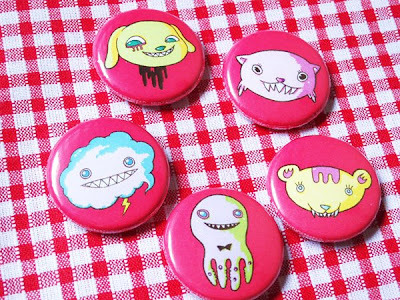 Here are my latest collection of button pins / badges! They are only 1" so I thought to sell them in a pack for more impact. I still have another set of 5 designs which will turn up in 2-3 weeks time, can't wait! The candy set is inspired from a long time ago when my classmate had this Cutest (yes with a capital 'C'!) pencil case in dark blue back in the 1980s. I really liked it as a child and would constantly steal a peek at it. 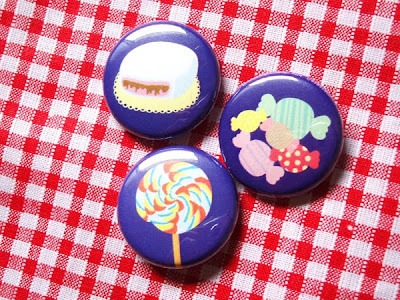 The cover was a scenery of a park with a fountain, Japanese-made no less; so now I want the same flavour to these pins. fantastic badges! I like the monster pets ones best, especially the blood-drippy puppy and cloud, their teeth remind me of chain-chomps in Super Mario 64! Yes I love videogame design before it all went too 'realistic'!